There is no end in sight to this spring like weather. There is a chance for snow over the weekend, but probably not enough to influence the fishing. If anything it may dampen the urge to travel to the lower Lost River or the South Fork of the Boise. The good news is, when its 40 degrees outside in January, you won’t have ice freezing in your guides! The fishing on the Big Wood has been generally good, although the constant high pressure and bright sun make for diminutive Midge hatches on most days. Trying to find that classic winter day with Midges lining the banks and fish heads up everywhere is hard to come by. The good news is, with less than stellar skiing conditions we have a bunch of great winter fisheries to fall back on! If we do get a short low pressure system in over the weekend, anglers may find the conditions right for some great dry fly activity. If you see heads up try Griffiths Gnats and Tie-Down Midges fished in tandem. If nothing else the cloud cover should provide a darker day and perhaps get some of the bigger fish out in the open and moving about the river systems. This could be especially true on Silver Creek, where a darker day should turn the Streamer fishing on. The weekend system should be brief, so be prepared for more of the same the rest of the time. Expect Nymphing with Midge patters like Zebra Nymphs and Brassies to take fish and have some Streamers to fish in brighter patterns on the bright days. 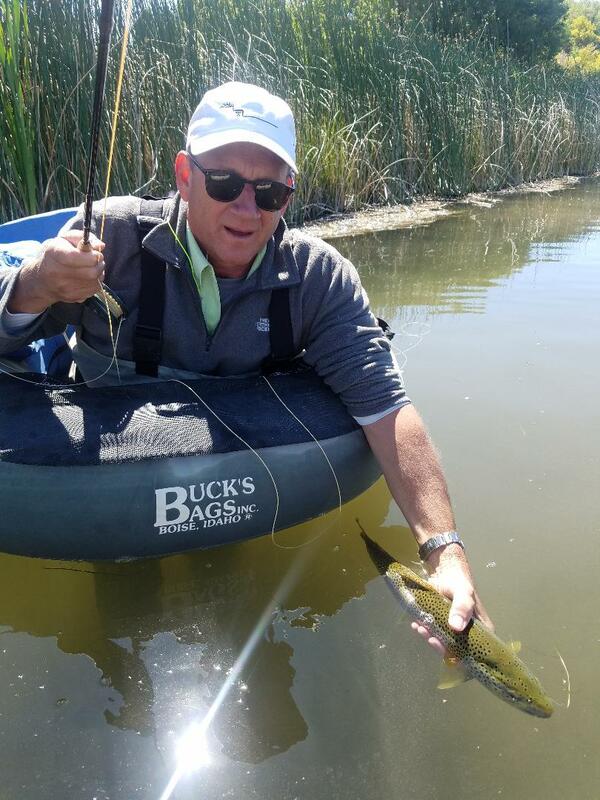 Mini Zonkers are one of our favorites on any of our area rivers. If you fish the Creek, be aware that Duck Hunting season is still happening for a few more weeks, so please don’t approach areas where you see decoys in the water or hear shooting. The Creek is open to catch and release fishing downstream from the Highway 20 Bridge. With the holidays complete, we know a lot of anglers will be heading to the Salt Water in the coming months to chase flats species. Picabo Angler has a ton of experience in this warm water arena and we are happy to help advise you on your trip, build you a trip, or even host you and your small group to one of our favorite destinations! Get out there and explore! Cold days and short fishing windows are the norm right now, but the rivers are wide open and seeing very, very little angling pressure. This is a good time to get out on the water, as the day time temperatures are rising above the freezing mark, making fishing comfortable throughout the afternoon. Silver Creek is now closed upstream of the Highway 20 Bridge. This includes the Double R Ranch as well as the Silver Creek Preserve. The river does remain open from Highway 20 downstream for catch and release fishing. It will remain open until the end of February. Streamers are really the best way to fish the Creek this time of the year. Think about using dark colors on dark days and bright colors on bright days. Cast your streamer to the far bank and retrieve it slowly. With the water turning colder, the fish will be more inclined to chase something they can catch without a huge expenditure of energy. Some days, just let the fly swing without stripping it. You may be surprised by the difference. In any event, the fish will want a certain speed and action, so keep adjusting until you find it. Once you know how they want the fly presented, stick to it! The Big Wood is one of our best “offseason” fisheries, as it rarely freezes and the fish tend to pod up into winter holes. Look for slow moving, waist deep water is a good start. 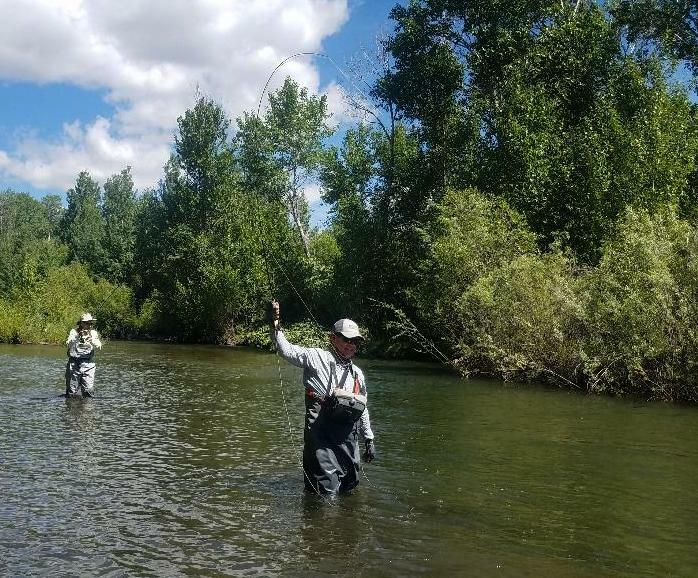 The fish should mostly be in the center of the runs, avoiding the fast currents, unless the big Midge hatches are going, in which cast look for the fish in the heads and tails of the pools. Fish Streamers and nymphs. A two Nymph rig under a strike indicator is a great way to go. Try Brassies and Zebra Midges. The Lower Lost is still fishing decent and there is hardly anyone fishing it. The drive is enough to keep most anglers away, and throw in a dash of cold weather and you can have it to yourself! It is primarily a Nymphing river this time of the season. Normally the same flies you would use in the winter in the Big Wood will work just fine on the Lower Lost. Finally, the South Fork of the Boise can be a nice excursion on a sunny day. Again, the same winter Nymph selection is all you need! Fall like weather has continued into the Holiday Season. This has brought the Baetis hatches on Silver Creek all the way to the months end. The last day to fish Silver Creek upstream of Highway 20 (Silver Creek Preserve) is Thursday, November 30th. This is your last best chance to fish dry flies on the Creek until the opener in late May. The Creek remains open downstream of the Highway 20 Bridge until the end of February, but this is mostly Streamer and Mousing water as we head into true winter weather. If you fish the Creek this week try to be on the water by 10:00 or 11:00 a.m. and if you want to fish dries, get your licks in by 3:00 p.m. Streamer fishing will be effective throughout the winter on the downstream stretches and through Kilpatrick Pond this week. Fishing on the Big Wood is consistent with nymphs and streamers right now. The cold weather Midge hatches will appear eventually, in the meantime cover a lot of water and fish the riffles with Price Nymphs and Zebra Nymphs. Olive Buggers will take fish throughout the system, so get out and take advantage of the warm days! The Lost River is much like the Big Wood this month, it is mostly a nymph fishery. Strike indicators and double nymph rigs fished deep will take fish. Pay close attention to the ledges and drops, as the fish like to nose up to those area adjacent shallow water, yet within racing distance to deep cover. Try Copper Johns in Red and in a variety of sizes. The Lost River fish will also key on your favorite Midge patterns. The South Fork of the Boise is still a viable fishery and the driving conditions into the canyon are good. It is a quiet time on the South Fork and most area rivers. This may be the quietest time on all the area water until the Christmas crowds arrive. With hunting and skiing in full swing, and not many people in the Valley until the week before Christmas, the rivers are seeing few anglers. If quiet fishing is what you like, you’ll not find a better 2 to 3 weeks. If you need any help on the water, our guide staff is still heading out daily and having great luck! We switch to winter guide rates on December 1st, so don’t hesitate to take advantage of the low rates, especially novices and beginners. It’s a great time to learn a little before next summer’s season! 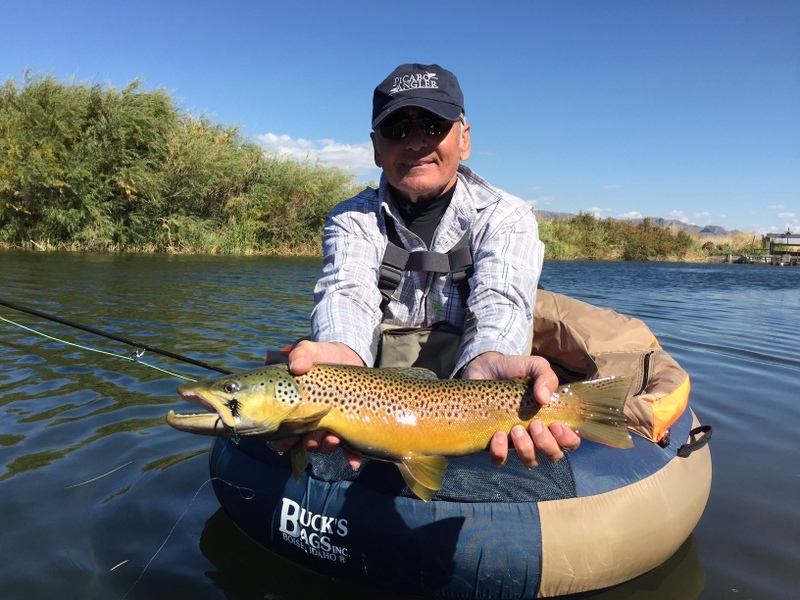 Winter has arrived in the Sun Valley Area, and with that comes winter fishing! We are blessed to have some of the best winter fishing in the west. We will slowly transition to full blown Midge season, and with that comes all our winter dry fly opportunity. In the meantime though, get your strike indicators out, your double Nymph rigs and your Streamer box as well! Silver Creek remains open to fishing upstream of Hwy 20 until the end of November. Anglers may continue to see a few rising fish on Baetis hatches in the middle of the day, if the day gets warm enough. The Brown Trout should be mostly done spawning and although they may be thin, they should be looking to put some fat stores away as fast as they can this month! The river downstream of Hwy 20 remains open until the end of November. This water is best fished with Streamers between now and the end of the season. The Big Wood is always a steady fishery this time of the year. The Rainbows feel the water cooling and they will eat with a little less caution than they have been the past few months. Fish Nymphs or Streamers throughout the system. 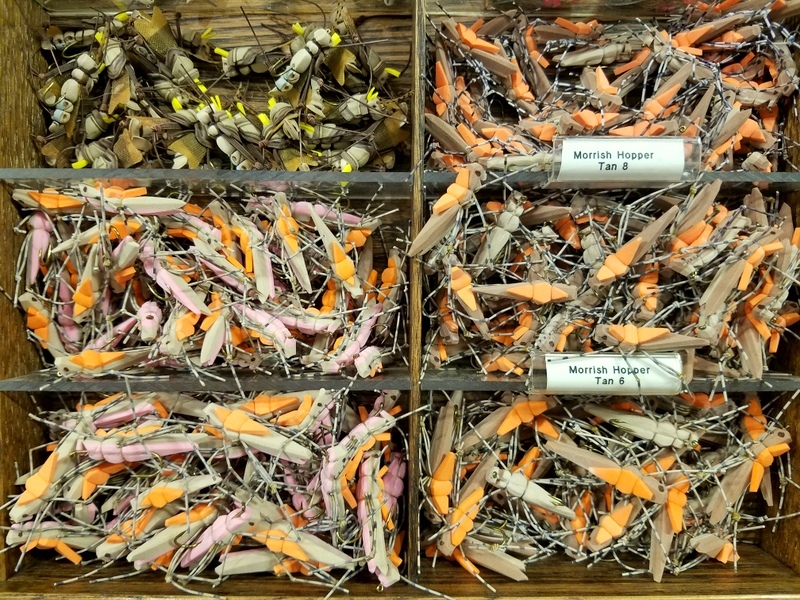 Copper Johns, Prince Nymphs and most Olive colored Streamers will bring plenty of fish to the net. The South Fork of the Boise is another decent early winter fishery where a nymph rig fished in the deeper runs and holes will produce some nice sized fish. Use caution when driving down the hill to the river in inclement weather. If it snows, don’t go without tire chains. The Lower Lost River is also a fun place for early winter fishing. Double Nymph rigs fished with a heavy fly paired with a small Midge patterns can be very effective. Red or Black Zebra Midges are an excellent choice when fished under a Bead Head Prince Nymph, Hares Ear, Pheasant Tail or Copper John. Keep an eye on the weather in the next few days and weeks. Pay special attention to the day after change…the second of two consecutive sunny days or the second of two consecutive cloudy days is the time to be fishing. Not to beat a dead mule here, but also please remember a change of warm dry clothes when you fish, charge your cell phone and be ready for a cold weather emergency!